"She never talks down to you. 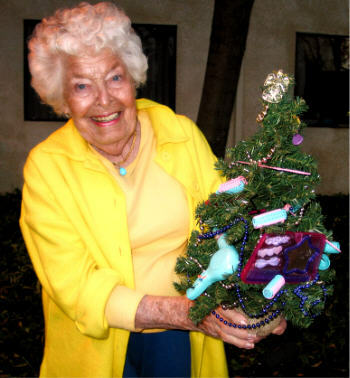 She is genuine and it comes through," says 84-year-old Doris Freidman. "She does not go down Memory Lane and make you feel sad. She sings it uplifting and it makes me feel damn good." "She got me interested in playing the doumbek and in the last six months since then I have gone doumbek crazy,"
says 89-year-old resident Stan Winston who performed alongside Perrin at DrakeTerrace Feb. 2007, playing the tambourine and doumbek drum. "I decided I can't check out now because the drum is my future. She is a real person and treats us as real people." "I was having a bad day. I was down in the dumps and you really perked me up. Your music was truly enjoyable!" "You made me feel so alive. I felt like I'd been asleep and now I'm awake. Your music made me feel wonderful." "ain't gonna rain no more, no more"
Joy's in our lives--our spirits soar!!" Hmmmmm. Can you hum a few bars of "hip fracture, heart disease, kidney failure, stroke, lung disease, cancer, my heart is broke.....the nursing home blues?" Old age with its illness and injuries costs countless millions of dollars each day for doctors, nurses, medicine, and equipment. 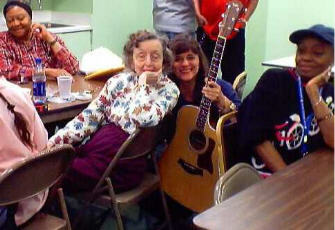 Yet, for pennies in comparison, one woman with her guitar and a song...reaches deep inside individuals in hospitals and nursing homes and pulls out a bit of joy, visiting their bedsides and singing their blues away one chord at a time. She's known as the Strolling Minstrel and patients ask for her by name....'Joy'. One man at Novato Hospital was dying...end stage heart and lung failure. A widower for over 16 years, his quality of life had declined to a low ebb. He said he didn't know if he was more sick or tired, or tired of being sick. Joy sat by his bed searching his memories and playing songs that took him back to times when he was younger. He smiled and his finger and toes began to tap. She played request after request and a glow came through his eyes. That day was one of his last, but she chased his blues away one chord at a time. Thank you, Joy Perrin. That was my Dad. Feb. 2004: Footnote to Marin Independent Journal; My name is Connie Hirschmugl. You recently printed the obituary of my dad, Robert Keefer. During one of his last hospital stays, he enjoyed a visit from Joy Perrin, who stayed at his side for about an hour, singing and playing the guitar. I have observed, first-hand, the amazing regenerative results. I feel this is a human interest story the public would enjoy. Please consider printing it. content © Joy Perrin 2008.